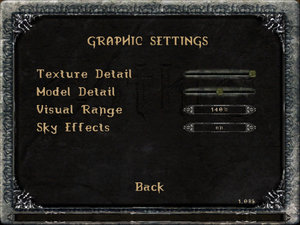 Use Gothic ½ — SystemPack to remove the 25 FPS cap, fix compatibility issues, and improve resolution support. Steam overlay doesn't work with this game. Install the version 1.08k patch. Only sold as part of bundles. Install the version 1.08k patch. The original German release included a performance by In Extremo that was omitted from later German releases and all international versions. Use the In Extremo Mod. The Russian Gothic: Collector's Edition includes Gothic and the Diccuric mod. 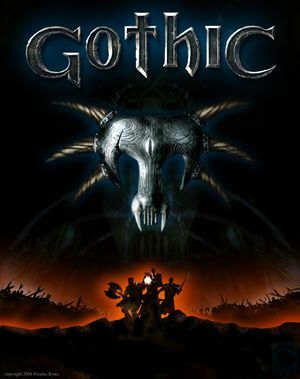 The German Gothic Collector's Edition includes Gothic along with Gothic II and its expansion. The latest retail patch is version 1.08k. Some digital distribution versions already include this patch. To check your current patch version look at the bottom right of the main menu box. The Player-Kit is required for playing mods. Causes a minor issue with a gate near the end of the game; use Gothic ½ — SystemPack to avoid this issue (recommended) or use Gothic_backup.exe temporarily to pass this area. If you are using a disc version ensure you have the latest patch (see Patches). Download and install the Player-Kit. Mods can now be installed. The in-game version number is changed to 1.08k_mod. Gothic will now show a mod selector window when launched; to have a shortcut launch the unmodded game directly, change it to point to GothicMod.exe instead of Gothic.exe. Fan-made patch, introduces many fixes and features. Download and installation instructions here. Requires PlayerKit. Save your changes. The game will now go directly to the main menu when launched. The original German release included a performance by In Extremo; this was omitted from later German releases and all international versions. Download the In Extremo Mod. Extract to Data in the installation folder. Start a new game. In Extremo will perform during Chapter 2. Only some resolutions listed; see Widescreen resolution. Use Gothic ½ — SystemPack. Works with limitations; see Windowed. Works with limitations; see Borderless fullscreen windowed. Force in the graphics card's control panel. 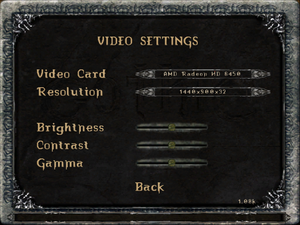 Forcing in the graphics card's control panel may cause black videos. Capped at 25 FPS by default; use Gothic ½ — SystemPack. Use Gothic ½ — SystemPack. Framerate affects sliding on terrain. Gothic only has native support for 1280x720, 1280x768, 1280x800, and 1440x900. Right click the shortcut and choose Properties. Replace the XXXX parts with the width and height of your resolution. Click Apply. Use this shortcut to launch the game with your chosen resolution. Task-switching may cause repeated Tab input when you return to the game (simply press Tab again to make it work normally). Task-switching during video cutscenes will crash the game (there are only four during the game, not counting the intro and ending). Run the game at least once. Change scaleVideos=1 to scaleVideos=0 (otherwise videos render in the corner of the screen). See Windowed for the limitations of this mode. Install the Gothic ½ — SystemPack. Set zStartupWindowed=1 in Gothic.ini (see Windowed). Set your desktop resolution in-game. Gothic should now display as a fullscreen borderless window. No cursor; buttons and wheel work but can't change settings. Set in Settings, Game, Invert View. Disabled by default; set in Settings, Game, Subtitles. Change Soundprovider to EAX 2. 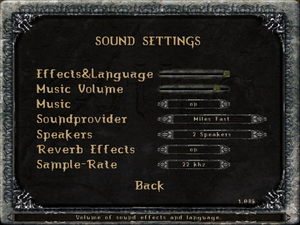 Hardware accelerated DirectSound3D and EAX2 (on compatible sound cards with restoration software like ALchemy or 3D SoundBack) isn't available until the fix is applied. Available on Steam, despite not being stated in the store page. Only two translations, by Snowball Studios (1C-SoftClub) and Russobit-M.
See Helix Mod: Gothic [DX11]. Inventory item graphics turn invisible on ATI 1xxx cards (the items themselves are still there). There is no known fix. One potential fix is to add zInventoryItemsDistanceScale=2.0 under [GAME] in GOTHIC.INI. This is caused by forcing anti-aliasing. Either method below will fix this. Open your graphics card's control panel. Save your changes. Videos will now display centred. Gothic and Gothic II show a window border in fullscreen mode on Windows 8 and later. The GOG.com version already includes this fix. Right-click the game in the Steam Library. Uncheck Enable Steam Community In-Game. Click Close to save your changes. Browsing to the game's Steam folder and running as Administrator will work as well, if disabling the in-game overlay does not. This can be caused by deleting the saves folder. Make a folder called saves. If you want to delete saves in the future delete the individual saves within the folder, not the saves folder itself. A gate in the final area won't open when playing with the Player-Kit due to the cutscene not playing. The GOG.com version prevents task switching to avoid some potential issues (e.g. crashing during FMV cutscenes). Open Programs and Features (appwiz.cpl). Find and remove the GOG.com Gothic entry. If you are using Windows 8 or later, install the Gothic ½ — SystemPack. Gothic will now allow you to task switch at any time. After task switching the game may constantly repeat Tab ↹ input; press Tab ↹ again to stop this. If you have multiple monitors, disable/unplug all of them except the one that you're using to play Gothic. Gothic doesn't see dsound.dll wrapper from EAX restoration software. Write exactly dsound.dll to document. Launch game, change sound provider to Creative EAX 2 and quit. Launch game again and check if sound provider is still the same. Users with SystemPack installed have to change FixMss=1 to FixMss=0 in SystemPack.ini configuration file. SystemPack uses own implementation of restoring surround sound, which is purely software and because of that EAX restoration software won't make effect if FixMss is set to 1. ↑ 2.0 2.1 File/folder structure within this directory reflects the path(s) listed for Windows and/or Steam game data (use Wine regedit to access Windows registry paths). Games with Steam Cloud support may store data in ~/.steam/steam/userdata/<user-id>/65540/ in addition to or instead of this directory. The app ID (65540) may differ in some cases. Treat backslashes as forward slashes. See the glossary page for details. This page was last edited on 8 April 2019, at 10:46.